Eggs, a basic egg-dying kit or homemade dyes. Shaped paper punches (found in craft stores). Cut your freezer paper into strips that are roughly the same width as your painters tape and attach the tape to the shiny side of the paper. Punch out your shapes from this paper/tape combo. Peel the paper off your "stickers" and place them on your eggs. 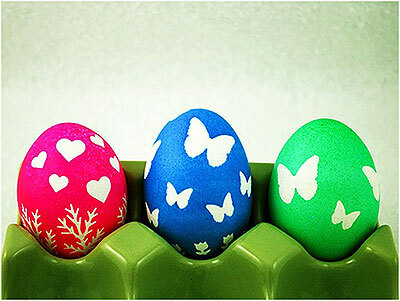 Submerge in your dye, allow the eggs to dry and then, peel off the stickers.